The UB men's basketball team used a dominating second-half performance against Miami (OH) on Saturday afternoon, beating the Redhawks 88-64 for their third conference victory of the year. The Bulls are now 15-1 overall and 3-0 in Mid-American Conference play. 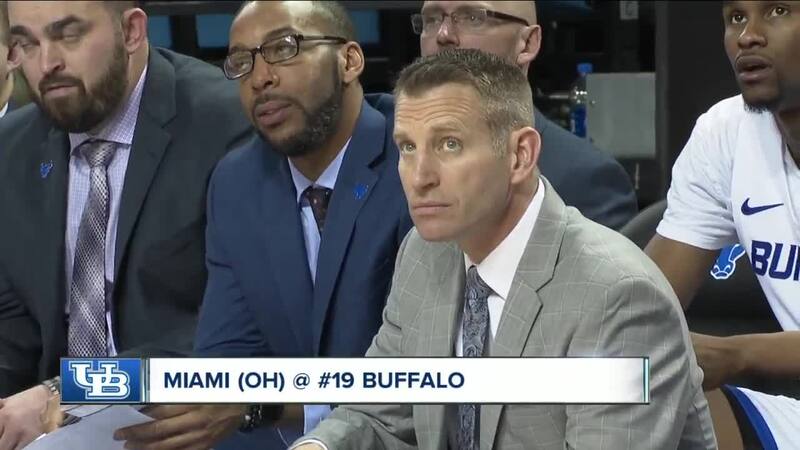 AMHERST, N.Y. (WKBW) — The UB men's basketball team used a dominating second-half performance against Miami (OH) on Saturday afternoon, beating the Redhawks 88-64 for their third conference victory of the year. The Bulls are now 15-1 overall and 3-0 in Mid-American Conference play. The Bulls built a four-point lead at halftime and came out firing in the second half. They were led by Jeremy Harris who had 17 points. Four other Bulls ended in double figures. The win marks UB's 19th straight win at Alumni Arena, a school-best. The Bulls will be back on the court next Tuesday when they travel to Western Michigan. it will be the first meeting between the Bulls and Broncos this season.